International Journal of Research in Health Sciences,2014,2,3,908-910. 1,2,3-Junior Resident, 4-Senior Registrar, 5-Associate Professor, Department of Surgery, Regional Institute of Medical Sciences, Imphal, Manipur, INDIA. Clinical entity of gastric outlet obstruction (GOO) is frequently encountered in clinical practice. The diagnostic workup of GOO involves various modalities like upper gastrointestinal endoscopy and guided biopsy; imaging with computerized tomography (CT) scan; diagnostic laparoscopy. Aetiology of GOO has a wide spectrum with benign diseases like peptic ulcer disease and eosinophilic gastritis (EG) on one end and malignant lesions like carcinoma stomach on the other. 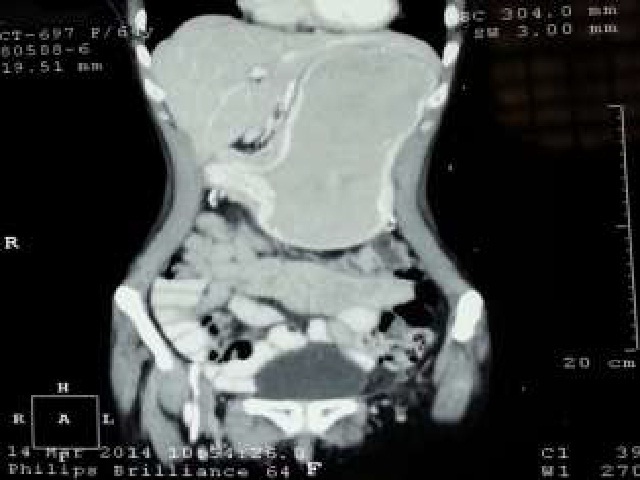 Here we present a 64 year old elderly lady presenting with vomiting and lump in abdomen. The repeated endoscopic biopsies were inconclusive and CT showed features suggestive of EG. Final diagnosis turned out to be carcinoma stomach (adenocarcinoma) on laparotomy and palliative gastrojejunostomy (GJ) was done. The case is presented for its diagnostic dilemma.